In the Fiba Europe U20 European Championship Women Division B final, Great Britain held on to win against the Slovak Republic while the Czech Republic won against Portugal and got a bronze medal. The MVP votes to be put in later. 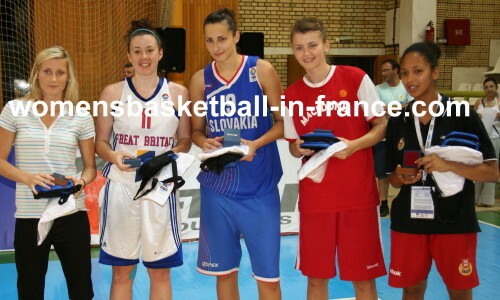 The all tournament team was made up of Katerina Sedláková from the Czech Republic, Charlotte Stoddart from Great Britain, Klaudia Lukacovicová from the Slovak Republic, Jelena Antik (MVP) from Macedonia and Maria Correia from Portugal. Both teams had a slow start with just 6 points scored in the first three minutes with GB leading (4-2). The GB coach was already turning his bench as his players searched to make scoring chances. Zeljko Vukicevic, the head coach from the Slovak Republic, decided to call an early time-out with just under five minutes played with his side trailing (4-8). Veronika Cernáková fired in the first trey of the evening shortly after the time-out. Both teams were closing down defensively, making it next to impossible to find an opening. Charlotte Stoddart's run down the baseline for a lay-up + foul was the last score of the first quarter in open play. Kashmere Joseph picked up an offensive rebound off a long shot attempt and was fouled. She split the free-throws for Great Britain to edge the first quarter (11-7). Great Britain's control of the rebounds enabled them to stay in control of the game. Kristie Sheils opened up at the top of the key and fired in a trey for the first points of the second quarter. The Slovak Republic were unable to get anything going and Great Britain started to get adventurous. Mairi Buchan fired a trey from way down-town which she concluded with a fast break for Great Britain to lead (22-9) with five minutes left to play in the quarter. The Slovak Republic were not helping themselves in missing the unmissable. Despite the height advantage of the Slovak Republic they were unable to get the ball to their big women in the paint. Klaudia Lukacovicová finally broke the Slovak Republic barren spell with a hard drive to the basket. Barbora Novocká finally got a shot off from beyond the arc to the delight of the Slovak fans. But their joy was short lived when Renee Busch launched a rainbow three just on the buzzer (25-14). Lukacovicová recovered from her knock at the end of the second quarter to put the first points up of second quarter. The first three minutes of the quarter became a battle of the bigs as the teams traded basket for basket. The Slovak Republics more patient approach and clutch shooting from Lukacovicová and Cernáková enabled them to draw nearer and nearer (27-34). Rebecca Allison kept on popping up in the most unexpected places as Great Britain managed to hold on to the lead (37-30) with four minutes left to play in the third quarter. Great Britain were punished for careless turnovers. With 2:18 to play, Damian Jennings called a time-out with his side still in the lead (39-36). The Great Britain coach's words seemed to have worked as his team prevented the Slovak Republic from scoring to go into the last quarter (41-36). The game was getting scrappy with Great Britain still hanging on (43-40) until Novocka put the Slovak Republic in the lead with less than five minutes to go (44-43). Yet Allison was fighting to get loose balls back but the Slovak defense did not allow her a free run. Another time-out by Damian Jennings helped as Buchan put in a lay-up for her side to go back ahead. Yet the Slovak players reversed the game and were 1 point in front when Durojaye scored under the basket. Then another time-out by Jennings tried to stop the Slovak aggressive play (47-46). After the time-out the Slovak players had the ball but did not score for Great Britain to take the rebound. Despite throwing the ball away, Great Britain hung on to win (47-46). Buchan and Durojaye were in double digits for Great Britain while for the Slovak Republik Lukacovicová and Cernáková. Both teams came out fighting for the bronze medal right from the tip-off. Alena Hanusová was a one-lady demolition truck with the first 6 points for the Czech Republic. However Portugal fired back with a coast to coast from Maria Correia and a typical put-back in the paint by Sofia Da Silva. The people watching were not allowed any breather because Katerina Zavázalová fired in the first baseline trey of the evening. The Czech Republic continued to find holes in the Portuguese defense as they continued to hit shots from all over the court to go 12 points clear with just over five minutes played (16-4). Things went from bad to worse for the assistant coach of Portugal, José Araújo, when he discovered that Da Silva was on 2 fouls and Telma Fernandes limped off the court. The Portuguese have shown in this tournament that they are fighters. With Da Silva, Michelle Brandao and Joana Bernardeco put in 7 unanswered points. Aneta Pulpánová ended the barren spell for the Czech Republic to win the first quarter (18-12). Bernardeco was allowed too much room to work in. So she fired in back to back scores to bring Portugal to within 1 point of their opponents with just over three minutes played in the quarter. Jiri Johanes, the coach from the Czech Republic, made three changes, quickly followed by a shot from the land of many by Katerina Bartonova. The two teams played end to end basketball but were not able to put many points on the scoreboard. This resulted in the Portuguese coach requesting for a time-out with 90 seconds to play and his team trailing (24-27). The Czech Republic maintained the advantage to go into the locker room leading (31-24). After the break it was the turn of Portugal to step up collectively. Da Silva and Bernardeco took on the responsibility of scoring all the points as Portugal went in front for the first time (37-33) midway through the third quarter. Correia added 3 more points for Portugal before the Czech Republic came storming back with Hanusová and Bartonova. The teams were back on level terms once more (40-40) with Adéla Filarová concluding a fast break. Portugal reclaimed the lead with a slip that left Carolina Escorcio free for her first points of the game. Portugal continued to hustle in the paint and were rewarded with 2 more points to take them into the final quarter ahead (46-42). The Czech players dominated the final quarter and kept Portugal scoreless for just under seven minutes while scoring 14 points to take command of the game (56-46). The Portuguese players did not find back their shooting touch for the Czech Republic to take bronze in the 2010 edition of the Fiba Europe U20 European Championship Women (61-47). For the Czech Republic were in double digits with Bartonova, Kuslilova and Hanusová with 13, 12 and 10 points respectively while for Portugal Da Silva and Brandao had 16 and 12 points each.